Viswanathan Anand's reign as the world champion came to a heart-breaking end with Norway's Magnus Carlsen taking the crown after a hard-fought draw in the 10th game of the World Chess Championship match here. Admitting that newly-crowned world champion Magnus Carlsen dominated the duel, five-time title holder Vishwanathan Anand on Friday said that the loss in the fifth game of the World Chess Championship match turned out to be a "heady blow" for him. "The fifth game was a heady blow. I had really hoped not to be afraid of him in the long games and simply to try and match him. It was not to be. After that it got worse and worse. Yesterday at least it was a nice game and today again...I guess when it rains it pours," a disappointed Anand said at the post-match press conference. "Its clear that Magnus dominated. At the start of the match I thought my chances depended on my ability to last long games without making a mistake. This year I have had problems with mistakes creeping in to my play. I tried to pay some attention to that. But in the end it was in vain because the way I lost the fifth game is exactly I thought I could not afford to lose. A fine position in the opening and slowly slip and so on," he noted. Anand might have lost his crown to someone 21 years junior to him but the Indian was a picture of composure while admitting that he committed mistakes today also. "I think today I was just trying to keep playing and at some point started to make mistakes. I made a wrong queen move. 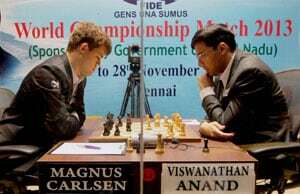 I simply don't know the evaluation after the match, the knight ending is pretty dangerous," Anand said about the final game that ended in a draw. Anand was gracious in his defeat and congratulated Carlsen for his splendid victory. "Its enough to just congratulate him (Carlsen). My mistakes did not happen by themselves. Clearly he managed to provoke them and full credit to him," Anand said. Asked about the third game where he had chances to go one up, the Indian ace said he did not attach much significance to it. "Things look different with hindsight. At that moment I did not attach any excessive significance to it. Obviously I was disappointed I did not call the position right. It was a little bit disappointed then. With hindsight you can exaggerate anything. As far as I am concerned game five was when it started to go wrong," Anand elaborated. Anand also said that he could not execute his plans in the match. "I had a feeling this match will be about execution. Holding at the board and seeing it through was really what its about. Game five was the real low point for me. Till then nothing had really happened. I was simply not able to execute my strategy," he said. Asked about his future plans and his comeback, Anand said he would think about it later. "Well that's getting a bit ahead. I want to first get some rest and take stock of what has happened. Come to terms with everything here. At the end of the day my play in the match was a big disappointment. I didn't manage to any of the things I tried to aim for. I assume I will play the candidates (In March 2014 to qualify for next world championship match)," he said.